Aimee Bartis: Pump It Up! 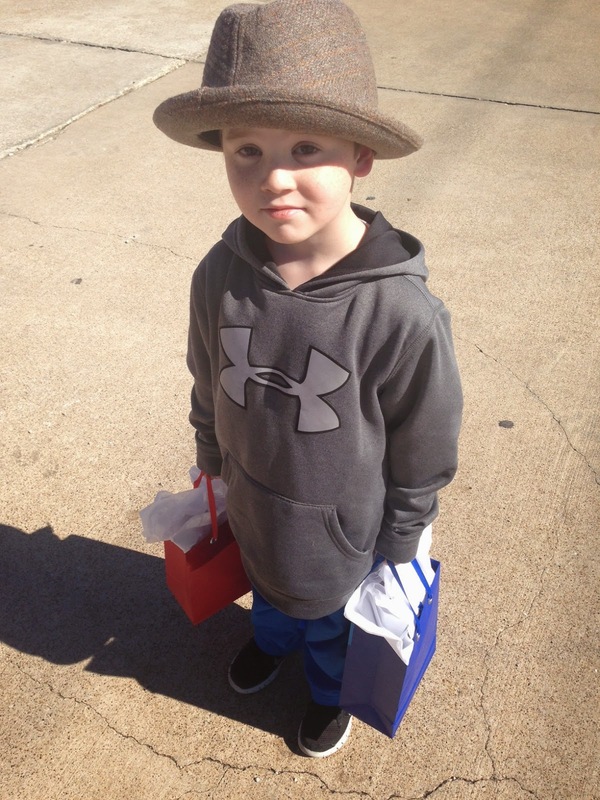 Yesterday was a big day for B-man! He was invited to a birthday party by a set up twin boys. 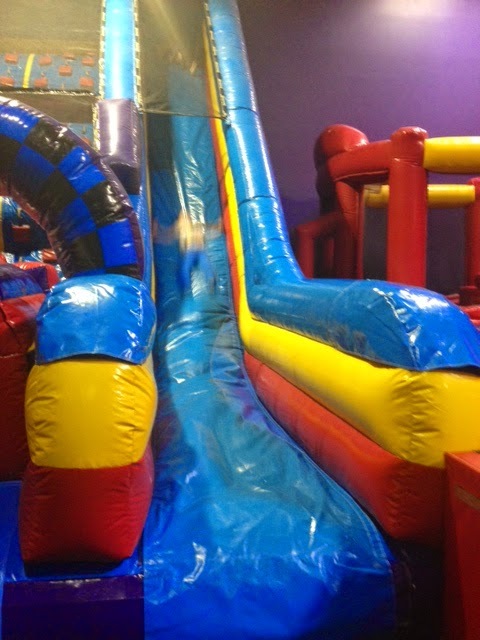 The party was at Pump It Up, an indoor inflatable park. I thought that this was B's first non-family birthday party but he reminded me that he went to a party at the pool across from our house for another set of twin boys. But he had never been to Pump It Up. He was so excited! We shopped for the boys at B's favorite store - Target. B wasn't sure what to get them until he saw Mixels. Mixels are some kind of Cartoon Network/Lego mash up. The Mixels didn't come in a big set, just one small character so I tried to convince B to choose something else. Nothing doing - so he choose 3 Mixels for each boy. Of course, we had to get B a Skylander. A small price to pay to leave Target happy. B separated each boy's Mixels into bags and even wrote on each card. He was ready to go! Pump It Up has 2 rooms. You spend 30 minutes in each room. The first room had an inflatable with basketball hoops and giant sticks to joust with American Gladiator style (the original one, that is). B had a lot of fun in there. 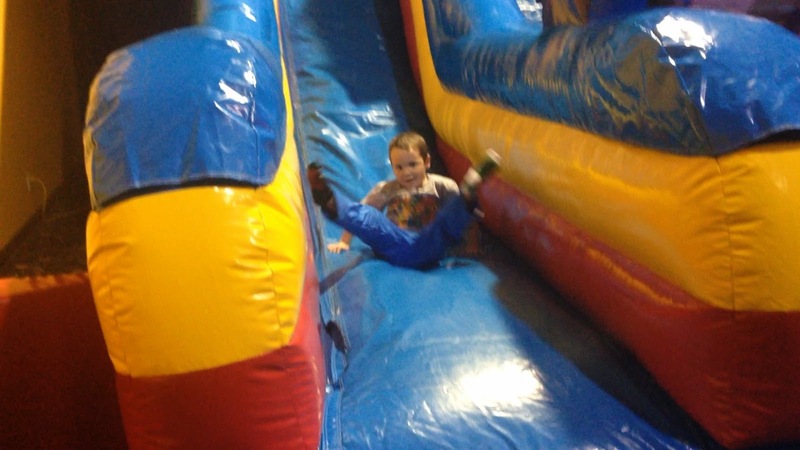 Then he moved on to the giant slide. The catch is that he had to climb up to the top first. The climbing portion had red footholds and black hand holds. B would get up the first level then fall down. The second room was not so awesome. They played for a bit then started a glow party. The kids got glow necklaces and the lights went out. B did well for a little while. He started playing a video game with other kids. It was a kinect game where the kids 'hit' balloons and they popped on the screen. B had a hard time understanding what to do and he didn't handle losing very well. He got upset and asked to go outside. Yes, you read that correctly. B ASKED. TO. GO. OUTSIDE. Pre-meltdown. He was upset but he had not lost it yet. So we hung out in the lobby for a little while. He wanted to try again after about 10 minutes. And, wouldn't you know it, he went back to the game and became upset again. This time he decided he wanted to go home. He was pretty upset so we didn't say goodbye. I texted the boys' mom and let her know. When we got in the car, B was very adamant that he 'hated Pump It Up' and that 'we should never ever go there again'. I told him how proud I was of him for the way he kept trying in the first room. I told him that I saw him work hard to get to the top of the slide at first. Eventually, he said he did like the first room but not the second. I said that was ok. Things don't have to be all good or all bad. Things can be part good and part bad. This morning B told me that he'd like to have his birthday party at Pump It Up. Yesterday was so full of win for my B-man! !